Illustrates the range of the principal members of the Animal Kingdom and the productive industries of the countries of the world. Map of The World Showing the Geographical Distribution and Range of The Principal Members of The Animal Kingdom. Map of The World Illustrating the Productive Industry of Various Countries, and exhibiting the principal features of Commerce and Navigation. 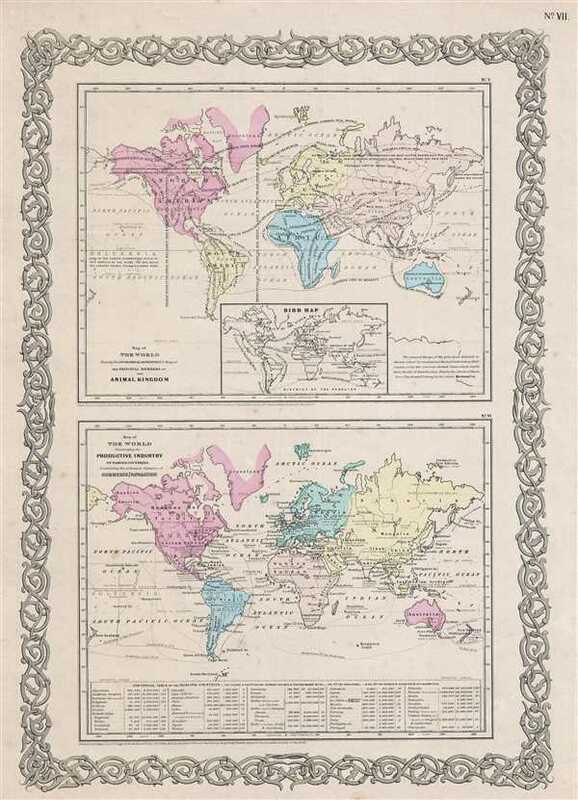 This is an 1857 J. H. Colton map of the World's animal kingdom and the productive industries of various countries. The map is actually two maps printed on one sheet. The upper map shows the geographical distribution and range of the principal members of the animal kingdom, with an inset 'bird map'. The lower map illustrates the productive industries of various countries establishing the principle features of commerce and navigation. Both maps are colors coded according to continents with countries labeled but their political boundaries not shown. Mainly focusing on the class of Mammals, the upper map depicts the general range and distribution of principal animals by continuous or dotted lines. A small paragraph in the lower right corner of the upper map contains information about the markings on the map. The lower map marks the products of each country and also indicates various sea routes. A statistical table on the bottom of this map notes the area and population of the principal countries. The whole is surrounded by Colton's typical spiral motif border. Dated and copyrighted to J. H. Colton, 1855. Published from Colton's 172 William Street Office in New York City. Issued as page no. VII in volume 2 of Colton's 1857 Atlas of the World.